Lucia Valentini-Terrani Interview with Bruce Duffie . . . . . . . . . The Italian coloratura mezzo-soprano, Lucia Valentini Terrani (born: Lucia Valentini), studied first at the Padua Music Conservatory, and later at the Accademia Benedetto Marcello in Venice. She made her stage debut in Brescia, as Angelina in La cenerentola, a role she will remain closely associated with throughout her career. 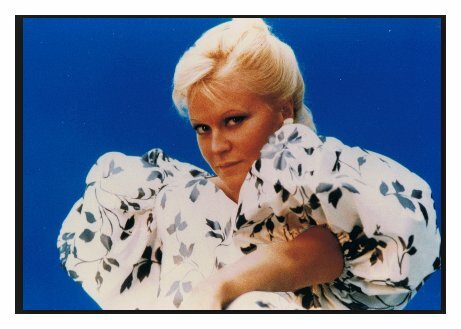 She made her debut at La Scala in 1973, again as Angelina, and quickly established herself in the Rossini repertoire, singing in L'italiana in Algeri, Il barbiere di Siviglia, Il viaggio a Reims. 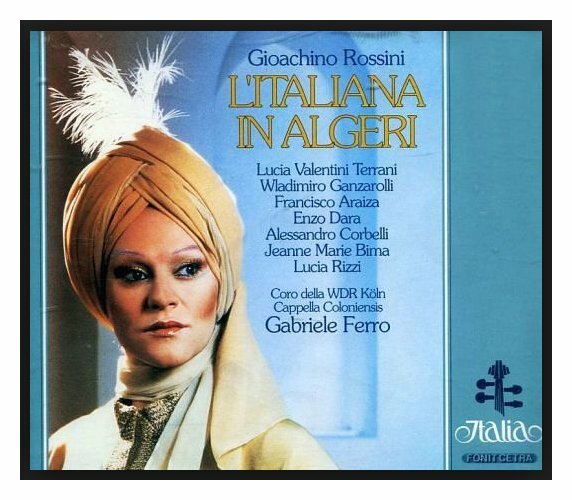 She also sang the many "trouser roles" such as Tancredi, Malcolm in La donna del lago, Pippo in La gazza ladra, Calbo in Maometto secondo, Arsace in Semiramide, Isolier in Le comte Ory, etc. She also sang a few roles of the Baroque repertory, notaby Monteverdi 's L'Orfeo, and Bradamante in George Frideric Handel 's Alcina. However, she did not restrict herself to the belcanto and expanded her repertoire to include roles such as Dorabella, Eboli, Quickly, Mignon, Octavian, Charlotte, Dulcinée. 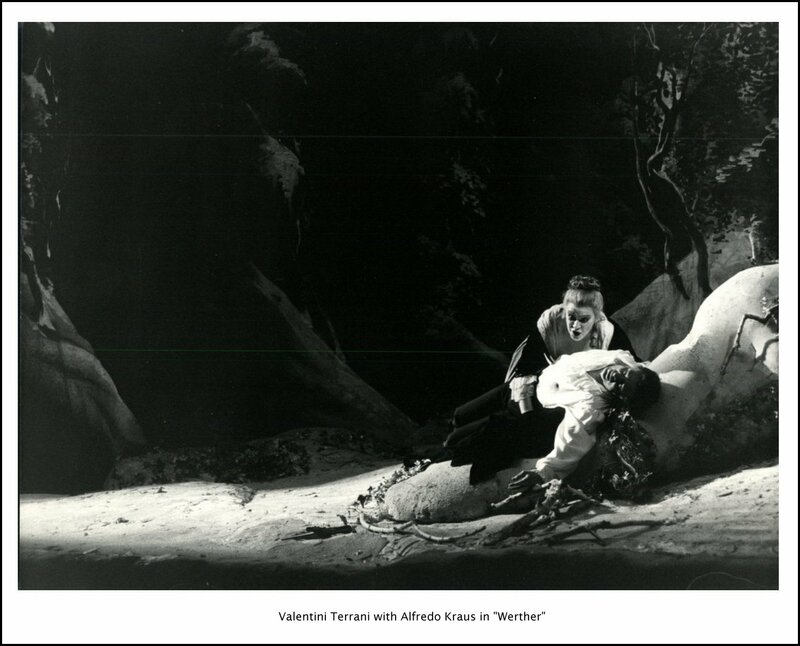 Valentini Terrani enjoyed a very successful international career, appearing in Paris, London, Moscow, Buenos Aires, Chicago, Los Angeles, Washington, etc. Lucia Valentini married Italian actor Alberto Terrani in 1973, and added his surname to hers. She was diagnosed with leukemia in 1996, and went to the famous Fred Hutchinson Cancer Research Center in Seattle for treatment, where her colleague and friend José Carreras was treated for the same affliction. Sadly she was not as lucky as Carreras, and died of complications following a bone marrow transplant at the age of 51. 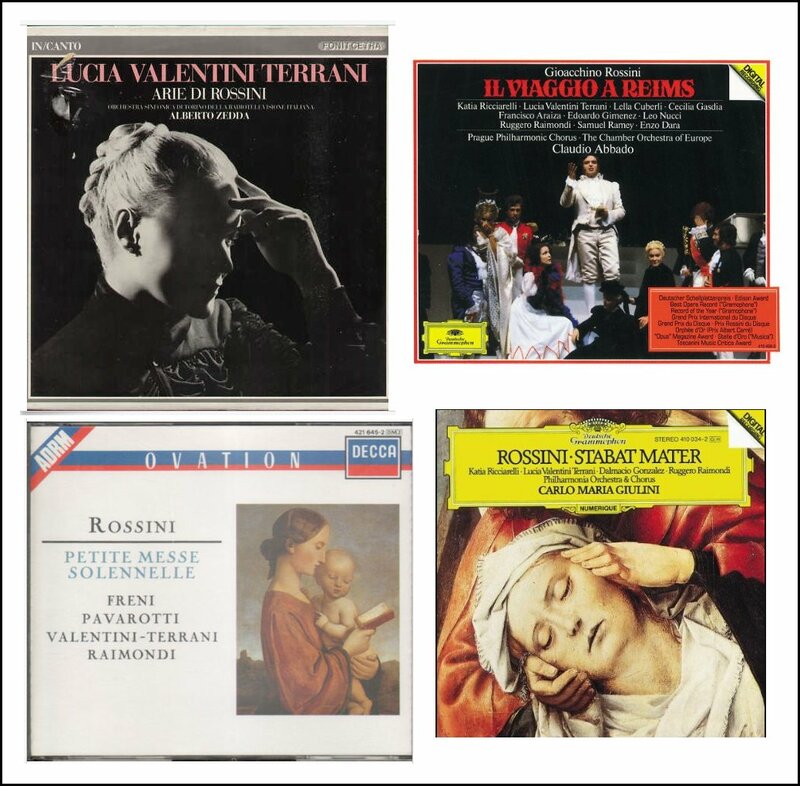 The name Lucia Valentini Terrani was (and still is) seen both with and without the hyphen between her last two names — even in such open and public displays as the covers of her recordings. Since she, herself, signed the photo above without the hyphen (despite it being in the printed credit), I have opted to omit it on this webpage. Though her life was tragically cut short, she will always be remembered by those who saw her, and we do have a small but impressive legacy of recordings she made of her major roles. 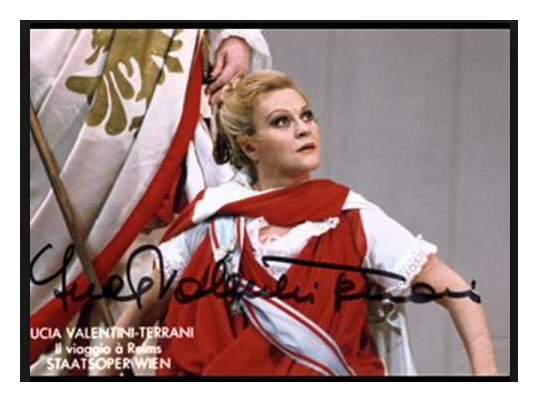 As can be seen in the chart below, Valentini Terrani appeared in Chicago at both Lyric Opera and with the Symphony. It was in 1981, between performances of Don Quichotte that I had the pleasure of sitting down with Valentini Terrani at her apartment. The conversation was always thoughtful and often filled with laughter. My thanks to Marina Vecci of Lyric Opera for providing the translation during the delightful hour. Naturally, we spoke of Massenet, and that section of her remarks was published in the Massenet Newsletter soon thereafter. Other portions were aired on WNIB, Classical 97, when we played some of her recordings, and now I am pleased to present the entire conversation on this webpage. After a brief bit of discussion about cakes and chocolate, we got down to the musical ideas . . . . . . . . .
Bruce Duffie: Is it correct to call you a coloratura mezzo? Lucia Valentini Terrani: I would say it is correct, although we should be careful when defining or categorizing voices as it always is a very difficult thing, especially for the mezzo soprano. I was born as a Rossini mezzo soprano. In fact I’ve always been associated with Rossini roles — La Cenerentola, L’Italiana in Algeri, The Barber of Seville, and Le Compte Ory — and now I’m doing all the serious works by Rossini — Semiramide, La Donna del Lago, and so forth. But let’s talk later about Rossini ‘serious’. Let’s start with the Rossini ‘buffo’. I was always a Rossini mezzo soprano rather than a Rossini contralto. BD: What’s the difference between a contralto and a mezzo? LVT: A contralto is the corresponding voice for the woman as the bass is for the male voice. But there are very different types of contraltos — the ones that are suitable for Bach, the ones that are suitable for Brahms, and the ones that are suitable for Rossini. It’s a type of voice that is disappearing. It’s a very difficult definition to give, and is also very difficult to define what a true mezzo soprano is because it’s not the range which determines this voice. It is only the color of the voice which defines the contralto, and the color of the voice changes in the same way as the color of the eyes. You will find as many colors as there are voices. BD: Do you enjoy singing the darker parts? 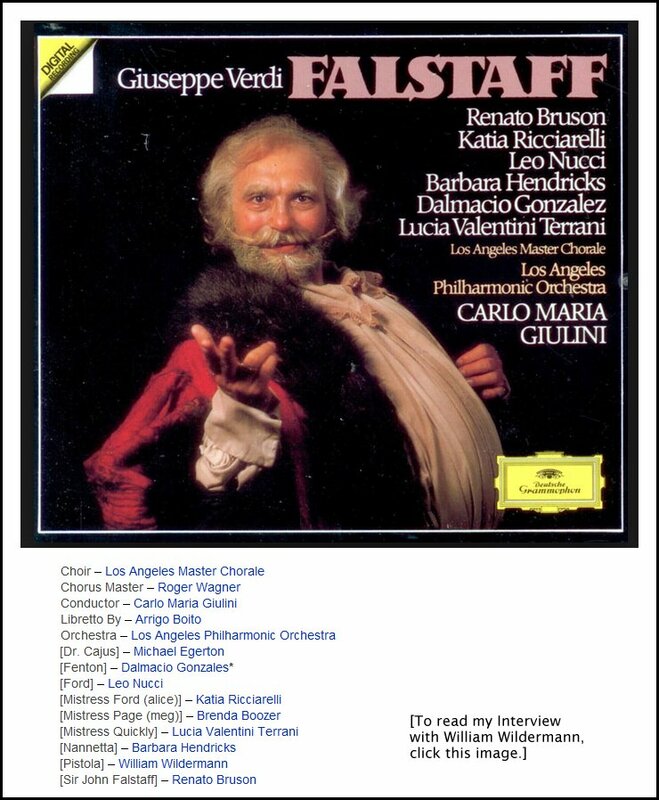 LVT: Although having grown older, going on in years and studying different parts, I have also added what is called a ‘Falcon’ [pronounced fahl-CONE] mezzo soprano type, like Charlotte in Werther, which I’ve been doing lately. Dulcinée in Don Quichotte is also that French kind of mezzo soprano. Berlioz also has this kind of mezzo. The definition is that of ‘Falcon’, but let us not get too much into these details because otherwise we’ll never end. There are very long discussions about these things. Cornélie was enrolled at the Paris Conservatory from 1827 to 1831. There she first studied with Felice Pellegrini and François-Louis Henry, and later with Marco Bordogni and Adolphe Nourrit. 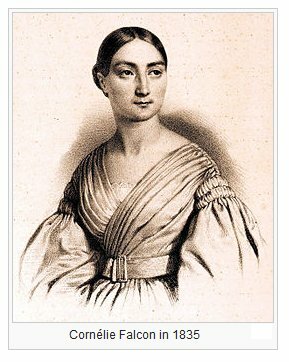 She won a second prize in solfège in 1829, a first prize in vocalization in 1830, and a first prize in singing in 1831. Berlioz's admiration for the singer was considerable, and with Véron's permission he engaged her for one of his concerts which he organized that winter in the hall of the Paris Conservatory. It was the second in the series and was presented on 23 November 1834 with Narcisse Girard conducting. Falcon sang Berlioz's new orchestrations of the songs La captive and Le Jeune Pâtrie breton, and earned an encore in which she sang an aria by Bellini. The concert also featured the premiere of Berlioz's new symphony Harold en Italie, and the audience included the Duc d'Orléans, Chopin, Liszt, and Victor Hugo. With the new symphony and Falcon as the star singer, the receipts were more than double those of the first concert on 9 November, which had featured the Symphonie fantastique and the overture Le Roi Lear. However, La captive, and not Harold, was the hit of the show, with the Gazette Musicale (7 December 1834) calling it "a masterpiece of melodic skill and orchestration." People always ask me if I will do more Russian works, and I say perhaps because two years ago I did, at La Scala, Marina in Boris Godunov. I never really believed I would sing Russian music. I never thought about it, but I knew I would eventually come to do. I’d like to do it very much if there is anything suitable for my voice. I’ve also done with the Chicago Symphony Alexander Nevsky, and I will do soon Marfa in Khovanshchina because I adore Russian music. The career that I have started has been a very interesting one. I started with Rossini, and with the years and the changes of my voice, I got into a different repertoire. It is very important that one knows oneself very well so that one knows where one can go. It’s very important for a singer to have always Rossini and Mozart as a basis. For me, Rossini and Mozart are like a school, a way of learning, and even though my career is evolving in different ways, it’s very important that I go back to them because they’re a learning experience. I keep my voice in shape by singing them. BD: Will you ever go as far as Wagner? BD: I knew that the performances were scheduled so far ahead but I didn’t realize that recordings are also. LVT: It’s a very interesting project because it will be sung in French. It is very difficult to sing in French. It is not true that it helps the voice. Many people think that it helps the voice, but for me it’s a very difficult language to sing in. BD: Have you sung Leonora in La Favorite? LVT: Ah, interesting! I’ve never sung it but I’ve spoken about at La Scala, and perhaps it’s a future project. BD: Will you do that in French? To read my Interview with Anthony Rolfe Johnson, click HERE. 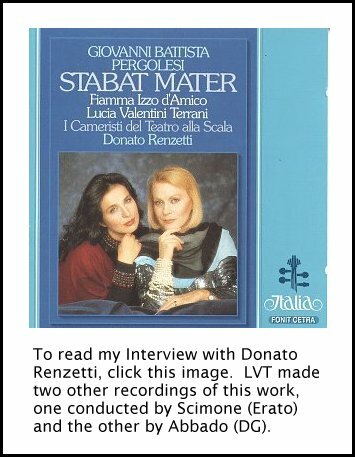 To read my Interview with Antal Dorati, click HERE. BD: Tell me about the difference between singing comic parts and dramatic parts! LVT: There is a substantial difference vocally and dramatically. Of course, the comic roles and the dramatic roles represent two extreme poles. They are both very interesting because they are the extremes, and it’s a very interesting question for me because I’ve sung things that belong to each category. For example, I will have my debut as Arsace, and vocally the serious Rossini is also heroic. Arsace is a hero and is a big part, so the singing becomes much more dramatic. LVT: It is agility that has to express force. It’s called ‘agilità di forza’, agility coming out of strength, which is a different thing from the agility that is required to sing Rosina because the two characters are so different. I am intending now to go into the serious Rossini roles because I started with the light ones, and given the fact that I have the coloratura, it gives me the possibility of using this coloratura in two different ways. The one way in the light vein, and the other is expressed with a great deal of strength but still requires a great deal of agility. BD: Is there a different kind of strength because you’re portraying a man as Arsace? LVT: Yes, and this is a very delicate point because of what you are required to do in a ‘pants role’. You have to use a force which will not ruin your momentum nor the agility of the voice. It’s force in the sense of being more dramatic. Of course the voice has to follow the character and has to become more dramatic. 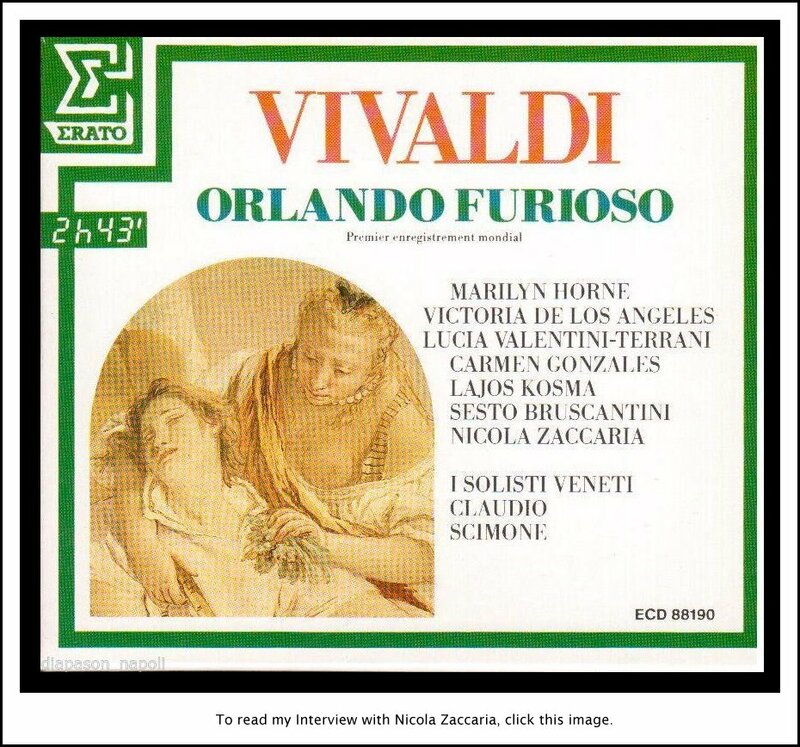 It will be interesting for me to sing a male role because Rossini wrote this role for a woman, leaving aside the fact that he really liked the contralto voice as a special voice. With his portrayal, Rossini meant to give the character all the sweetness of the woman but with the force of the male. BD: So you have to balance the sweetness with the force? BD: Is there any danger of making it too masculine? LVT: It certainly is a risk, but there’s no more of a risk involved than in doing any other character. For example, for me it could be very difficult or risky to do Charlotte more than doing a male character while I’m into portraying this character. Every time I have to sing a certain role, I have to believe in it to begin with. Then afterwards I have to entrust myself to use my talent and ability. BD: When you do Arsace, do you have a beard? LVT: No beard, just a beautiful costume with a cape. These are all very different characters that I do. When I did Marina in Boris at La Scala, they had a very famous Russian stage director, Lubimov, who had a lot of controversy. He wanted a very different Marina from what was usually done. She had to dance, and she had a very dark character like Lady Macbeth. BD: Were you pushed too much? LVT: It is very common to find directors that push too much in some direction. BD: Was the Boris in Russian or Italian? LVT: It was in Russian. BD: Do you ever sing anything in translation? BD: Could there not be a good translation? BD: Let’s discuss some individual roles. First, Rosina. LVT: Rosina is the most difficult. How many hours do you have?!!! LVT: We can all have dinner together! It’s too bad that I don’t speak English, because we do miss a lot of things in the translation. [Returning to the subject] Rosina is the most difficult character as far as I’m concerned because it’s not a well-defined character. It’s not well defined on the stage, like Cenerentola for instance, or like L’Italiana in Algeri. For instance, L’Italiana’ is a true ‘prima donna’. She moves all the others. Of all the other characters, she’s the one. She’s the motivation behind it all. In the first act she plays with Mustafà. She plays the ‘femme fatale’. She’s a complete woman. She is a woman of a certain age, and she’s a well-defined character. BD: A woman of a certain age! Let’s talk about that! To read my Interview with Sesto Bruscantini, click HERE. To read my Interview with Gary Bertini, click HERE. LVT: She’s a woman who has lived a lot. She’s a Tuscan woman. I don’t know whether there is a way in this case to define this kind of woman that comes from there. She decides the lovers that she wants. She goes to fetch her own lover. She is decisive. In the story she’s a very decisive woman. Rosina is a more complex character. She’s a young girl. BD: Is Rosina a virgin? LVT: Ah... I don’t know because there are so many women who say they are virgins but they aren’t. [Much laughter] This is a very interesting question. What concerns me is the connection between the singing and the action, which is projection. Rosina is even very difficult vocally because it has been sung a lot by light sopranos. So the tradition is that we do not have a mezzo who has sung Rosina. Only Giulietta Simionato, Teresa Berganza and Marilyn Horne have been singing her recently. They are very close to us, but in the past, sopranos like Toti Dal Monte sang Rosina. It’s a character that has been appropriated by the light soprano and has become their property. Therefore there is a different character from the one that the mezzo can portray, and of course also a very different voice from the mezzo soprano. BD: [With a gentle nudge] Is it because of the darker voice that it might make her virginity questionable? LVT: [Laughs] Perhaps, although there are some light sopranos who are questionable! Anyway, it’s very difficult for the mezzo soprano to go and study the character of Rosina because of all these things. It’s still essentially the property of the light sopranos. BD: Are we now starting a new tradition... or resuming one from the days of Conchita Supervia? LVT: Yes. It’s very difficult for the mezzo soprano who is trying to establish a tradition of Rosina to change the image of Rosina as sung by the light sopranos. The mezzo has been traditionally doing roles such as mothers and mistresses, and it’s very hard to keep the lightness that Rosina has been associated with. BD: I get the feeling that here in the States we are quickly accepting the mezzo soprano as Rosina. LVT: I agree, but only within the last two or three years this has happened, that the mezzo is accepted and welcomed. With Teresa Berganza and Marilyn Horne, this acceptance began, and the character of Rosina is a very difficult role to be faced by any singer, regardless of the voice category. Maria Callas was much criticized because as far as the critics were concerned she was not able to portray this young girl. They were used to her as Medea and Norma. Everyone thinks that Rosina is very simple role to sing, but I never found the Rosina that I really liked. It was either too sad or it was too light or too dramatic. BD: Do you enjoy singing it? LVT: [Hesitates] I’d rather sing other roles! I did it this year with La Scala in Japan when they took it on tour. One other reason why I don’t like it so much is because Rosina is under the four men! I am joking about this, but the four men are the motivation for the drama. It’s a very complex thing that the Rosina must fit into. BD: Given a choice you would rather do L’Italiana or Cenerentola? 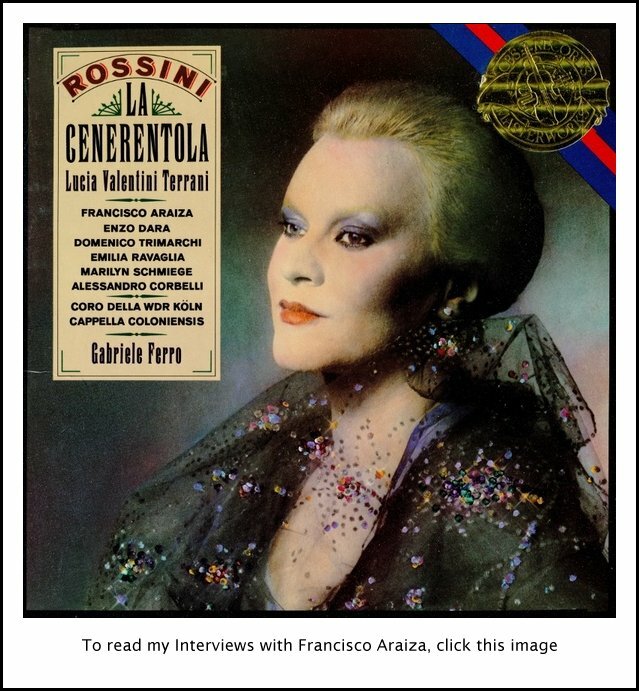 LVT: My career was born with Cenerentola, and it’s the most congenial, the closest to me. The reason is hard to define. It’s just something like a love affair. There’s no logical explanation. We can’t say why like one or the other. It’s just there. 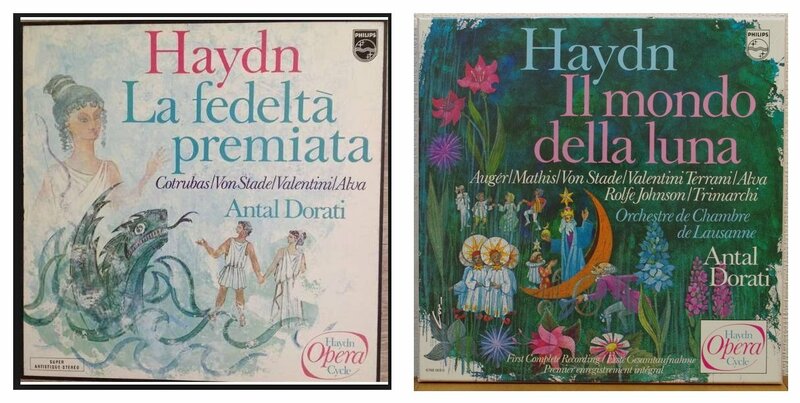 BD: Do you like the new editions of these works? LVT: In 1973 we did this Cenerentola with Abbado and Ponnelle, the production that also came here to Chicago. It was the old edition with the exception of one aria of Clarinda, because they said that Clarinda’s aria was interpolated by someone other than Rossini. BD: Do you interpolate anything into these works? LVT: Not at all because Claudio Abbado wouldn’t allow it. This is a very interesting thing because all the singers used to put embellishments in there. It is also true that the singers that allowed themselves to do that during Rossini’s time were probably better prepared to do so. But they were conforming with their times, and given the fact that Rossini apparently didn’t want that to happen. Rossini said they should do what he has written except where he puts the pen down and leaves something to imagination of the singer, where the singer can do a coloratura embellishment. Of course, one should have good taste and a lot of musicality to allow what you have to do the embellishing. BD: [With a gentle nudge] You wouldn’t do a five-minute cadenza? LVT: It’s very difficult to find a musical and intelligent cadenza. BD: Where do you go for your cadenzas? LVT: I study a lot and I try to prepare myself a lot. I do understand how they did it, and in those times they tended to change every evening, every performance. This is a very ill-defined time as far as cadenzas and embellishments are concerned. Teresa Berganza and Claudio Abbado only did what was written in the score. Marilyn Horne brought in a lot of embellishments. I think that virtue lies in the middle between Horne and Berganza. On one side it’s true that the singer should add some embellishments to the interpretation, but the singer should not destroy the design of the opera by his or her embellishments, as sometimes happens. The design is ruined if the balance is tipped. BD: Do you think that some of the productions destroy the line of the opera? LVT: There are many that destroy the general sense of the opera. It’s always a question that comes down to good taste, musical understanding, and talent. BD: Do you ever want to go to a producer and shake him up a little? LVT: Sometimes I have even walked out of productions. But then another singer, who was even a good singer, would step in and would agree to everything, so the protest failed horribly. BD: Then do you remember who these producers are, and agree not to work with them again? LVT: In Italy I have made a decision not to work with certain producers. There was a case in Italy where I refused to do it in three theaters because this producer was one with whom I didn’t agree at all. Singers should stand up to them, otherwise they will be destroyed by these producers! BD: Is it the same with conductors? LVT: I have been much luckier as far as conductors were concerned. I’ve always very careful to see who is the conductor, so I never have many surprises in that sense. I sing a lot with Claudio Abbado, George Prêtre, Carlo Maria Giulini, and Zubin Mehta. I will be doing Oedipus Rex with Leonard Bernstein at La Scala, and am looking forward to meeting him and working with him because I adore him as a conductor. BD: Let me ask about the difference between singing opera on stage and opera in concert. LVT: There is an enormous difference from the concert version to the fully staged opera, because the concert gives the possibility of being ourselves. For instance, in a concert version of Cenerentola, the Cenerentola I portray is very close to Lucia Valentini Terrani, whereas if the Cenerentola is in a fully staged opera, Lucia Valentini Terrani is Cenerentola. Cenerentola herself is the framework of the opera and lives within the story and the performance. That’s why the concert is much more difficult. There are fewer weapons to use in a concert version of an opera. BD: Do you enjoy doing non-opera concerts? LVT: Very much, but I find them very difficult. I love to do them. I like Mahler, Schumann, Wolf, Schubert... I sing a lot of concerts. One cannot say that I would rather do concerts than opera because they are two different things, but I do like to do concerts very much. BD: Let’s move over to Massenet. Right now you’re doing La Belle Dulcinée in Don Quichotte. LVT: It’s really something to do to be the Belle Dulcinée because Don Quichotte imagined La Belle Dulcinée, and one has to rise up to the occasion. And you know the audience is waiting for this Belle Dulcinée! BD: Is La Belle Dulcinée just in Quichotte’s mind? LVT: In this particular case he’s actually in love with this Dulcinée, so it could be. BD: So he could be in love with the dream? LVT: This is an interesting point, an interesting question. Do we know in real life whether we are in love with a certain person or in love with the idea of love? Don Quichotte is the greatest dreamer. He’s a fascinating character, and he’s in love with everything and everyone; with beauty and with love, and with everything that is beautiful. He was a great, great man, Don Quichotte. BD: Is she in love with him? LVT: In the end that is where she wants to be. I would fall in love with Don Quichotte. I would like to hallucinate being in love with him. Don Quichotte is a very tender character, and he teaches wonderful things. BD: Don Quichotte teaches Dulcinée about his kind of love? BD: So you would disagree then if a director wanted you to play her as a vampish kind of role? LVT: I discussed it very much with the stage director. The final definition of a character is due to the singer who portrays it. In other words, Lucia Valentini Terrani’s Dulcinée is different from someone else’s Dulcinée. BD: But it has to go into the whole conception of the work. LVT: Yes, naturally. I discussed it a lot with the conductor in this case. My aria at the end is so full of love and of sorrow, and I think that Massenet would have written a different aria if Dulcinée was different. When Don Quichotte proposes to her there is a change in her. At first she laughs about that, and everyone else laughs, but towards the end, her laugh is not a mocking anymore. There is sorrow in that laugh. It’s sort of the same thing as when your mother keeps telling you something and you never pay any attention. Then all of a sudden, it strikes something inside you. It is the same thing, but you see it in a different way. This is what happens with Dulcinée. At the end she would look at her life as a courtesan and say, “Perhaps I’ll never find true love, but I do have a heart, and I can and do love in spite of my past and in spite of my life.” Dulcinée is a very big, complex character. The laughing at Don Quichotte, which begins as mocking and then ends into a more desperate or more melancholy laugh, prepares the way for this aria in which she reviews her life. She sings about how her life was all a series of kisses and caresses, but perhaps she could have had something else. At this point her friends interrupt it and take her away, and the following day Dulcinée has probably forgotten all about Don Quichotte. But in that precise moment there was something, a melancholic regret about love. I feel that there is this regret in the music. BD: Do you think they could ever have been happy if she had realized it a little sooner and maybe gotten Quichotte to stay? LVT: Yes. She loves happy endings! But also because at the end she’s defensive. The last words she says, “Perhaps he’s crazy, however, it’s a sublime folly that he has.” So it means she has a certain affection for Don Quichotte. BD: It would have been an interesting to get them together. LVT: How beautiful, how beautiful! That would be really nice. It leaves the conclusion to the audience. I guess everyone can find his or her own ending. BD: Maybe we should have one more act, and in the last intermission have the audience vote on whether they should go together or they should go apart! 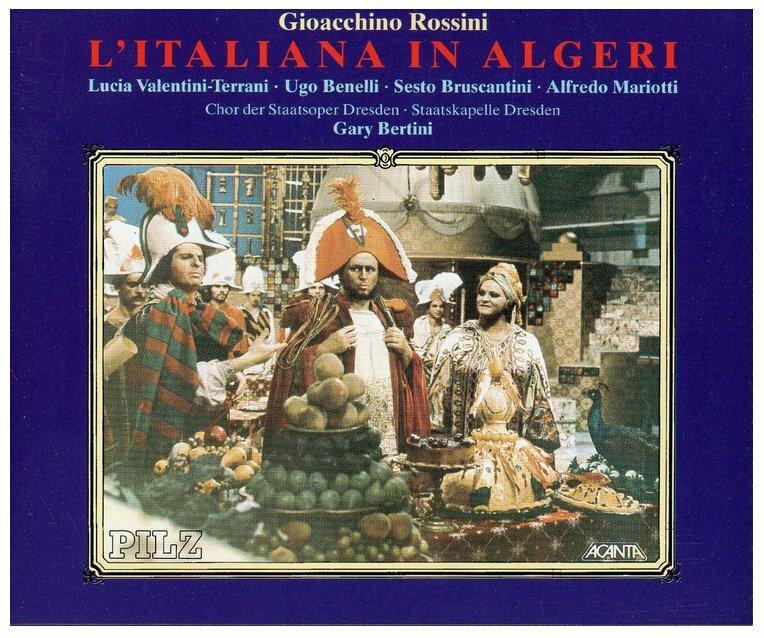 LVT: As in Rossini’s Tancredi. BD: Yes, with the two endings. Although the original version of Tancredi, presented at the Teatro La Fenice in Venice on 6 February 1813, had a happy ending (as required by the opera seria tradition), soon after the Venice premiere, Rossini — who was more of a Neo-classicist than a Romantic, notes Servadio — had the poet Luigi Lechi rework the libretto to emulate the original tragic ending by Voltaire. In this new ending, presented at the Teatro Comunale in Ferrara on 21 March 1813, Tancredi wins the battle but is mortally wounded, and only then does he learn that Amenaide never betrayed him. Argirio marries the lovers in time for Tancredi to die in his wife's arms. LVT: I would sing it with the two endings. Pier Luigi Pizzi is the producer in this case. He will do the sets and the stage direction. Perhaps there is a possibility that one evening we would do it with one ending, and then next evening maybe with a different ending. But that has not been decided. They struggled in Rossini, so there’s always this possibility of different solutions. BD: Let me ask you about Werther. Did you enjoy Charlotte? BD: It’s a beautiful production! LVT: Yes, it’s marvelous, with beautiful colors. BD: I love the way they handle the scene change between Acts 3 and 4, with Charlotte running to Werther. There are two or three openings of the main curtain to show her running to him. LVT: She runs and runs after him. It’s fantastic. Prêtre really conducts it beautifully. He’s very dramatic. It’s full of pain, and the scena just before the death is wonderful. It has a cinematic kind of quality. It’s a very difficult thing to do because the floor is plastic and is very soft, and it goes up and down. It’s very hard to step on this without falling. It’s foam, but it makes for a very beautiful scene. BD: Does it make for a better performance for you when you have super colleagues? LVT: Certainly! It’s an ideal situation when you have super colleagues to work with. I would like to have them all the time, just like now with Nicolai Ghiaurov! LVT: No other Massenet, but Berlioz. I will be doing Les Nuits d’Été, and I hope one day to do Samson et Dalila and also Carmen. Those are the two roles that a mezzo soprano dreams about. BD: [Suddenly reticent] I have a wonderful question about Carmen but I won’t ask it! LVT: It’s a beautiful question! There are people in life who one defines as whores, and then someone else will say it’s not really true. It’s relative. You’ll have to go and see my Carmen and then you will decide whether you like that or not! BD: Do you do any early music such as Monteverdi and Cavalli? 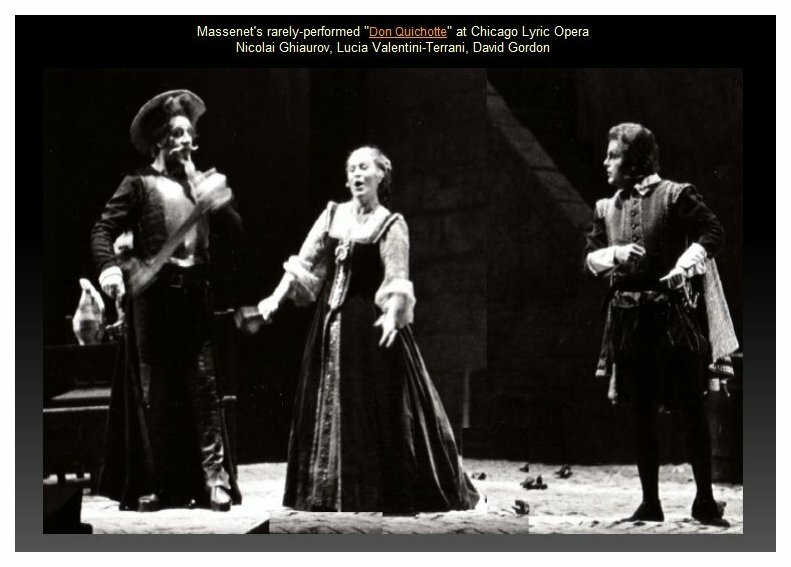 LVT: I sang a lot of Monteverdi and Cavalli including the part of Medea in Il Giasone. Before I went to the conservatory I was in a polyphonic choir, so I sang Orazio Vecchi and Palestrina and Monteverdi, all of those, and a lot of Vivaldi. BD: Have you done some stage works of these older masters? LVT: Not many. I had some commitments to do L’Incoronazione di Poppea in Vienna, but it didn’t work out, and for other productions of this kind of music. In a fully-staged production I never quite got together with the right conductor or the right stage director. At that time I had a commitments with La Scala for Rossini roles, and I preferred to stay and do those. The most difficult thing for a singer is to choose what things to do, and what is more important. It’s a very difficult choice. BD: It’s a question I like to ask all singers. How difficult is it to say no? LVT: It’s the most difficult thing to do, but it is necessary to do it. It’s so necessary that it doesn’t become difficult to say no anymore once you realize how necessary it is. One’s career is made by saying no. BD: Are there things you’ve turned down that you have regretted? LVT: No! I have no regrets because I have been realistic about my decisions and choices. There was always a reason for saying no or refusing something. I accepted my decisions and understood that the refusal was the best way of handling the particular situation. BD: Has she sung some unknown works such as Salieri or Pergolesi? BD: Unfortunately, they’re unknown here! LVT: Yes, Il Filosofo di Campagna but that was in the first years of my career. BD: What about new works. Do you ever sing contemporary opera? LVT: Unfortunately no! What would be modern for you? Berio or Nono? Luigi Nono had intended to do an opera for Raimondi and me, but has not finished as yet. It was to be done in Paris, but he’s still writing it! [Much laughter] Rossini wrote much faster! BD: When it is finished will you do it? LVT: Certainly. He’s a composer that I really respect and like. BD: Have you done some other world premières? LVT: I did a Nono opera, one of the few premieres that went on in Italy. There was a very small role for the mezzo. It was a beautiful opera called Al Gran Sole Carico d’Amore. Berio also is writing operas. It’s very difficult to choose things in contemporary music because first of all the composer should be more familiar with the singers than he is. He should be closer to the life of singers, and understand them better. BD: Should they know more about singing than they do? LVT: They should love singers more, and singing more. LVT: I will sing it right away, depending on the composer. If the composer loves the voice and singing, and is ready to write a role for that voice or for that singer, I would love to sing it. BD: So many different composers are called ‘voice wreckers’! LVT: It’s true, but perhaps the composers feel that they are rejected by the singers, and they might suffer from poor performances. It would be very interesting to know why there is this gap between composers and singers. But it’s a mutual thing, and it seems the composers are not looking for the singers, and the singers are not looking for the composers these days. LVT: No, I’m not, unfortunately! There are certain times that I just love to go and listen to, and other times I go selectively just to listen to the things I’m interested in, and then go home. Certain operas I listen to all the time, or I’ll go to all the time, like Orfeo of Gluck. BD: Is this another role for you? LVT: No, but I would to sing it. Although it’s right to say that one loves one composer over another, all great music is enjoyable. I just feel very happy to listen to Gluck as one of my favorite composers. I just love it. There is nothing more beautiful than the aria ‘Che puro ciel’ from Orfeo. LVT: No, I don’t like it, but one has to do them. I’d rather sing on the stage, but it’s something one has to do. In the end I’m usually happy having done it. This conversation was recorded at her apartment in Chicago on December 2, 1981. The translation was provided by Marina Vecci of Lyric Opera of Chicago. Portions were broadcast on WNIB in 1985, 1989 and 1996. The remarks about her Massenet roles were published in the Massenet Newsletter in January, 1986. This transcription was made in 2015, and posted on this website at that time. My thanks to British soprano Una Barry for her help in preparing this website presentation.